This will be our 17th year holding the Brandon Layton Memorial Raffle Benefit. This benefit is held every year at the Top Gun MX Team Shootout over Labor Day Weekend. We have dedicated ourselves to help raise money so we can assist local motocross families that have endured unforeseen medical expenses from a serious, life changing motorcycle injury or accident. All proceeds from the benefit raffle will be donated to an individual that has been seriously injured. We are looking for various product donations for this year’s benefit. We would like to request any tangible merchandise/product to give away in the raffle. We appreciate anything you can donate for this cause and we will be sure to give you the recognition for your donations. Brandon was incredible and highly unusual, even as a competitor he would compete with ruthless "kindness", encouraging his rivals with helpful advice, pats on the back and a charming smile that one would never forget. 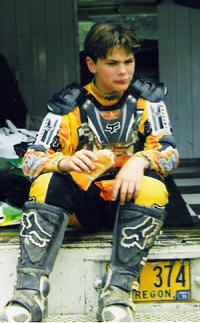 But Brandon's life was tragically cut short when on March 6th, 1999 he was killed in a head-on collision with another rider at the Beaumont Practice Track in Beaumont, California. Please email us your logo to include on all media documents. 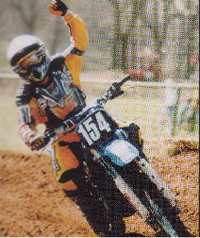 Brandon was a former Factory Yamaha Amateur rider and one of Fox Racing's prodigy amateur athletes. 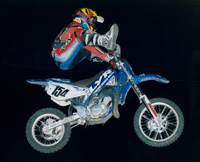 Seen here doing heel-clickers at age 10.